After a hard fought battle against cancer, Shyam Chainani died on December 25, 2010. I will miss him dearly, as will all those who worked with him and came to know him down the years. Pune: The Great Indian Bustard, which has been listed as a critically endangered bird, is steadily moving towards extinction. A global population count reveals that there are just around 300 birds left, compared to 600 in the year 2000 and 1,260 in 1969. The Gujarat High Court on Tuesday ordered a top official of the state's mines and minerals department to appear before it to explain inaction against illegal mining. Back to Raj era: Prince guns down man-eater leopard : WAS IT LEGAL? Yuvraj of the erstwhile state of Utelia near Dhandhuka, Bhagirathsinh Vaghela, shot a leopard that was believed to have turned man-eater. 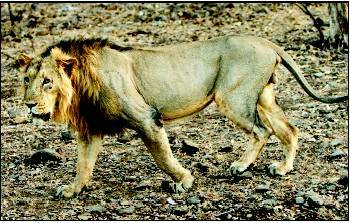 The Gujarat high court has stayed land deals in the periphery of the lions' den - the Gir sanctuary - as the issue of possession of land by non-Maldharis in the surrounding forest reserve is to be resolved before the division bench.